Microsoft's StorSimple is getting more Azurified with an 8000 series and tighter Azure integration and we can now report more about the two arrays. These 8100 and 8600 rackmount boxes are 2U and 4U high respectively and accessed using iSCSI over 10 and 1GbitE. They have inline deduplication, compression and thin provisioning. 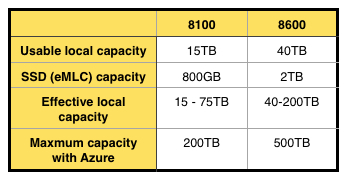 Microsoft says there are three storage tiers: local SSD, local disk and disks in the Azure cloud (Azure BLOB storage) and that what we have here is a hybrid SAN. The 8100 has 12 front-loading bays and both the disks and the SSDs are hot swap and mirrored. So, logically, that would give us two SSD slots and 10 HDD slots. As the devices are mirrored and the usable capacity is 15TB, we estimate there are 10 300GB 3.5-inch drives and two 400GB SSDs - the table says SSD capacity and not "usable SSD capacity". These are not Seagate Pulsar SSDs, we'd imagine, as Seagate doesn't have any 400GB eMLC SSDS in its lineup - that we know of. Xyratex has a OneStor AP-2212 12 x 3.5" slot, 2U enclosure using Intel Xeon C5500 quad-core CPUs. That looks a lot like the 8100 in appearance. The 8600 has 24 bays, and would, by extension, have 20 x 400GB disk drives and 2TB of raw SSD capacity. We can't see 1TB eMLC SSDS in our table of suppliers' products, so are not confident about there being 2 x 1TB SSDS. There is a 4U Xyratex OneStor AP-2424 product for IEMs which is probably the base box for the 8600. It has the same CPUs as the AP-2212. Data sent to and stored in Azure is encrypted. Protection is via local and automated in-cloud snapshots - backup to the cloud - and is, Microsoft says, application-consistent using VSS. It makes a point of saying there is instant recovery with "fast application-driven data restores." iSCSI persistent reservation provides clustered disk support. The 8100 and 8600 boxes accompany the existing 5000 and 7000 series products. Microsoft's material makes it clear that these are Seagate Xyratex boxes, quoting prices from that organisation. We're told the controllers are "Dual, Hot-swappable, Active/Standby with automatic failover." Seagate says the 8100 and 8600 hybrid storage arrays are built and distributed by Xyratex, not Microsoft. So Microsoft partners will need to have a Xyratex relationship to facilitate the ordering and delivery of them. Amazon, Microsoft's main Azure competitor, has its own cloud storage gateway apparently under development. Bezos boxes may as well store your local on-premises data as well as the bits and bytes you stuff into S3 and Glacier, etc. As the main cloud storage suppliers and main storage array suppliers both have their own cloud storage gateway products offering hybrid on/off-premises storage, startups like Nasuni and Panzura may feel they are caught between the jaws of a gradually closing competitive vice and will need to carry on developing and extending their technology to offer superior product facilities. The Vulture thinks it's also likely that hyper-converged server/storage/networking boxes – like those from NIMBOXX, Nutanix, Simplivity and EMC/VMware's coming Project Mystic – will need to add cloud storage gateway facilities of their own.